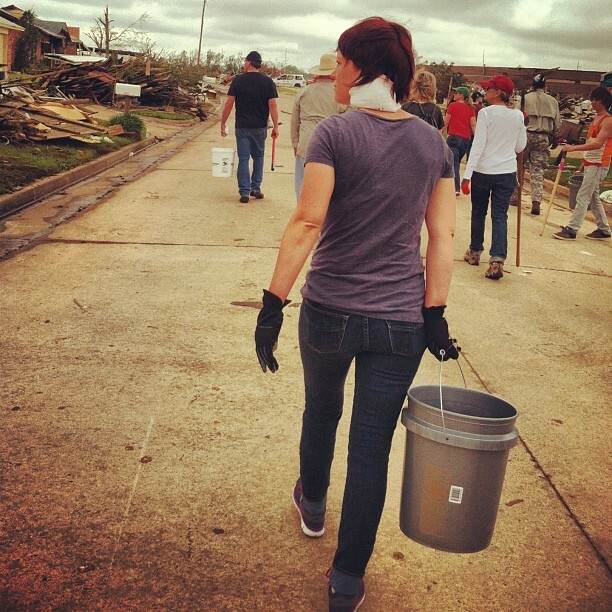 When Hasty, Pete, Patrick, and I were traveling along Route 66, we stayed in Oklahoma for a bit to help with the tornado clean-up. It was really devasting and kind of changed my perspective in many ways about life and its value and how good choices are important. Life’s nothing to waste. And there are good people in the world. I felt good about myself for helping. But it was also a very sad experience. When you do that kind of thing, you realize how unimportant material possessions are, other than those which sustain you, like shelter and clothing. It’s people that are important. But from the tornado, people lost so much more than just the material. They lost shelter and everything, and lives, and loved ones. And the photographs and symbols of memory were strewn everywhere. It was awful. And it makes you realize how to take the time each day to value life and that we cling onto the memories and put so much power in these items, which is human. Animals don’t do that, except maybe a dog with a favorite toy. I don’t know. Hasty says it so much better. So she wrote something for me and I’m pasting it here in my journal. I love my friends. I am lucky to have been given this break to travel with them. I miss my family though especially after the day we had. Today we helped a man look for his belongings underneath a 5 foot pile of rubble. His home was in the middle of all the Moore, Ok tornado devastation. Grimm was really quiet most of the day, more so than usual. He has a lot going on behind those eyes of his that rarely make it past his lips. Patrick and Pete were amazing and it turns out they make a really great team. I don’t ever remember Patrick being this happy…I hope it lasts because he deserves it. After getting instructions from one of the local Moore churches we packed up the van and snaked our way down neighborhood streets looking for someone to help. They told us not to throw anything away without asking permission. We all quickly learned the homeowners had only a few things they really wanted to find and didn’t care about much else. Well….the man we helped was like that. I think they were just ready for the nightmare to be over. Once we got to the site we started to walk towards the area that had been hit. Clean-up had been ongoing for over a month by now but there were still bulldozers and dump trucks and bobcats everywhere. After a few blocks I had to just stop. Grimm stayed back with me because I think he was thinking the same thing I was. I was having trouble comprehending it as real. I mean my mind wanted to tell me it wasn’t, that we were showing up to act in a movie film. After a moment Grimm grabbed my hand and squeezed it as if to say, “I know” and that was that and we walked on. By the time Grimm and I caught up to Patrick and Pete they had already found the man we were going to help. He was an older man who had survived the storm in the very rubble we were going to dig through. I think Grimm worried about me, every time I picked up a board he would say “Watch for nails” every time I was about to pick up insulation he would say “Mask up”. It was sweet but I was on a mission and growing up an electrician’s daughter I had been on my fair share of unsafe work sights. I am not sure what I expected but it wasn’t this, the realization hit me I was digging through the most intimate part of a person’s life. Every time I came across an unmentionable item I discretely threw it away. I caught Grimm looking at one such item in my hand like he was trying to read the title…he blushed when our eyes met. I was like, “dang this stuff is the real treasure. I mean everyone has unmentionables, why are they unmentionable if everybody owns said unmentionables??? ?” Grimm laughed at my observation so I am fairly sure he is going to make fun of my use of the term unmentionable. However, I did make a mental note to buy a heavy metal locking trunk for any unmentionables I own. Patrick found a shotgun under some rubble and was bringing the barrel up pointing right at me. I had a quick panic attack screaming for him to stop pointing it. He said the owner said it was safe but I don’t trust any gun I haven’t checked for myself. I was a bit annoyed when some of the manlier guys told Patrick they would take care of it. I could tell it bothered both Patrick and Pete but they just shrugged it off. I did find a dresser with one drawer full of colorful wigs and didn’t have the heart to throw them away so I made sure they made it to the valuables pile. Every once in a while families brought wagons full of hotdogs out for the volunteers and home owners. Then there were people bringing Styrofoam ice chests of water, and stew, and snacks. It was really beautiful to watch so many people doing something so good. While we were eating Pete found a pair of keys in the rubble that went to a car mangled up in a nearby tree. The owner thought it was funny but it was more like a hysterical laughter. A few hours in my allergies started acting up and my face and chest were breaking out from insulation contact. Wouldn’t you know that just as Patrick and I decided to take a break the owner would have a news crew follow him up to thank us for our help. It would have been really great and beautiful except I had snot running down my face because there was nothing clean to blow my nose on. I turned my back and blew my nose on the inside of my shirt and thought…great the news always captures people at their very worst. Patrick thought it was funny and the man just said “hey, I’ve been doing the same thing”. I am tired…it was a long day. I am glad we had this moment as friends to help those who lost everything. I am going to bed…Grimm was right…writing helps. I love my friends. *The real Hasty actually did help with the clean-up. I commend her on this kindness. What a great thing you did Hasty!